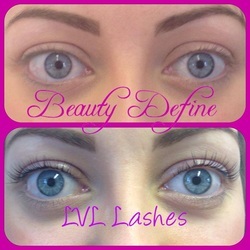 Beauty Define are now offering the hottest beauty trent, LVL lashes! LVL lashes will add Length, Volume, and Lift. A completely different treatment to lash perming, LVL lashes has been design﻿ed to enhance Client's natural lashes by straightening them rather than curling to create the illusion of longer, thicker lashes. The treatment takes between 30 and 45 minutes and lasts up to 6 weeks depending on the length and quality of your lashes.